Good article in by Deborah Weisberg in the Pittsburgh Post-Gazette outlining the PFBC's decision to reduce stockings by approximately 130,000 trout. Anglers will have fewer trout to target this year, following a Pennsylvania Fish and Boat Commission decision to stop purchasing outsourced trout. The agency has scrapped a program it began five years ago in which it purchased hatchery trout from Tellico Fish Farm in North Carolina to make up for the 2001 closing of Pennsylvania's Big Spring hatchery. Tellico had charged the state an average of $1.15 per fish (last year it was $1.27) -- significantly less than the $2.14 it costs to raise a trout at a Fish and Boat Commission facility. When this year's Tellico bid came in at $3.38 per trout, the commission drew the line. "It was all about cost," said the agency's fisheries management chief Leroy Young. "We couldn't afford it." The cutbacks will be spread across many lakes and streams to minimize the impact on angling, but, he said, "we can't make up the difference." 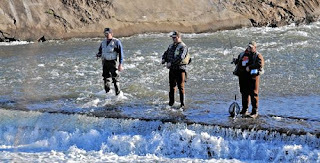 The change will mean up to 130,000 fewer fish out of an annual total of 3.3 million stocked trout, and may be the first of several changes anglers can expect as the commission re-evaluates its most expensive resource.